Barring some catastrophe, estimates suggest there will be 9 billion people living on earth by 2050. And they are going to need food. Some suggest the answer to this problem may lie with insects, which are an abundant source of protein. That may sound gross to us Americans, but in many countries bugs are already on the menu. And a pair of chefs, Ben Reade and Josh Evans, have been coming up with ways to prepare the creepy crawlies that are delicious as well as nutritious, traversing the globe to learn from other cultures what bugs taste the best, and how to harvest and prepare them in the new documentary BUGS. But do insects really live up to their potential as a panacea for world hunger, and perhaps just as importantly, do they even need to? BUGS does address those questions, and is at its most interesting when it is doing so. However, for the most part it plays like an extended episode of Andrew Zimern's 'Bizarre Foods' as we watch our intrepid culinary adventurers chow down on grubs, ants, beetles, termites, crickets, and more. As Ben and Josh learn more about both current bug consumption and the potential for turning the edible insect business into a corporate moneymaker, Ben starts to become disillusioned and leaves. He's replaced by Roberto Flore, who is a little less enthusiastic about his work but comes through nonetheless, even when he's tasked with agitating and catching really goddamn big stinging bee-type things in Japan. It's an enjoyable doc, especially if you get a kick out of being grossed out. I just wish BUGS had spent more time on its serious side. 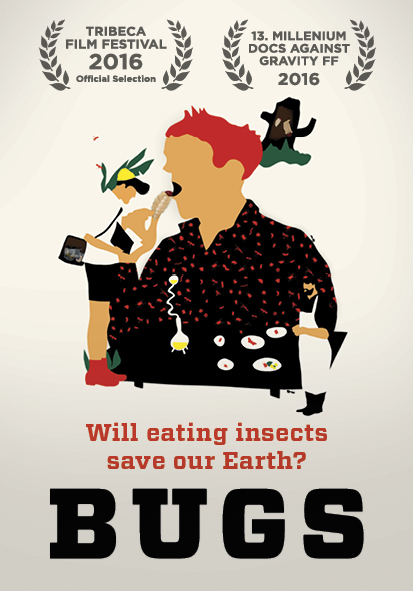 The film challenges the conventional wisdom that edible insects will have less environmental impact, its subjects claiming that industrialization of the industry will end up having the same sort of negative impacts as any other sort of corporate food production. But there's no data provided; just the opinions of the film's subjects. I'm not saying they're wrong; in fact, they're probably right. But at the risk of turning into a "talking heads" or "explaining and complaining" type of doc, there really needed to be some experts giving hard evidence to back up the claims. 2 ½ out of 4 stars.